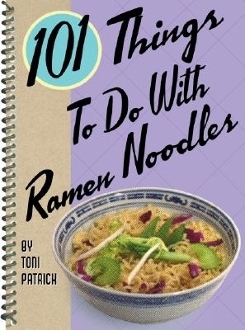 Expand your ramen repertoire with an amazingly inventive and unique addition to the million-copy-selling "101" series:101 Things to do with Ramen Noodles. Ramen is fast, easy, and filling, but what can be done to spruce it up and give it a whole new life? How about recipes like: Creamy Chicken Noodle Soup Summer Garden Soup Zucchini Salad Creamy Beef and Broccoli NoodlesRamen Burgers Chicken Alfredo Pork Chop Ramen Tuna Noodle Casserole Garlic Noodle Sauté Beer Noodles (the ultimate college crowd pleaser!) Chinese Veggie Noodles Corny Cheese Noodle.